Navigating the internet can be a difficult task. So on Safer Internet Day, our Anti-Bullying Training Officer, Hannah, is sharing her top tips on how to stay safe online. This Safer Internet Day we are working to inspire a national conversation about using technology responsibly, respectfully, critically and creatively. Working alongside other organisations, the Safer Internet Day campaign aims to empower young people to take control of their digital lives and consider their actions in an online context. 1. Only share things online which you’d be happy for everyone to see. Follow the ‘Granny Rule’ – if you wouldn’t be happy with your granny seeing it, don’t post it! 2. Don’t feel pressured to take and share selfies of everything you do just to prove it to other people. Use selfies to share things that reflect your interests and hobbies or to spread positive messages! 3. Choose your online friends carefully on social media – remember that anyone who you accept as a friend will be able to see what you have posted. They may be able to share or screenshot your photos or information and post them elsewhere. 4. Improve your digital footprint. Set your privacy settings, think before you post and don’t share any personal information. 5. Take a digital break if you’re feeling hooked to your device or pressured to be constantly connected. Try 30 minutes without checking notifications – the next day, try an hour! At The Diana Award, we support and encourage young people to be positive online role models. We also recognise that being a positive online role model means being able to raise awareness on many different topics from selfies and their impact on self-esteem to critical thinking and privacy. This is why we created the Be Strong Online programme in partnership with Vodafone. 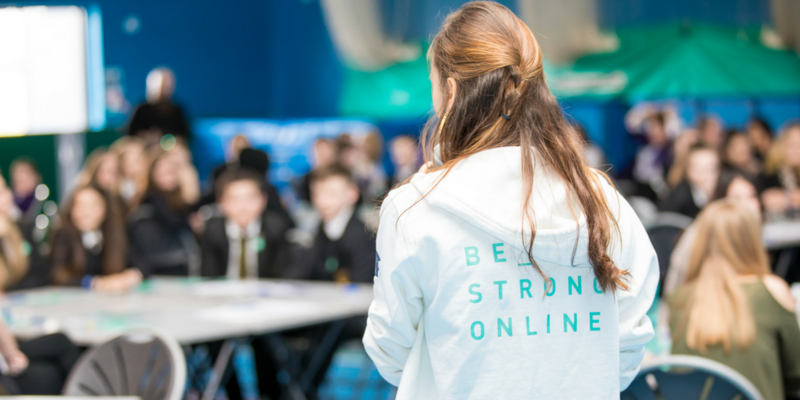 The Be Strong Online Ambassador Programme is a peer-led scheme for schools and youth groups to help young people explore the digital world safely. Covering topics such as Selfies & Self-esteem, Digital footprint, Gaming and Critical Thinking, Be Strong Online empowers students to share their experiences of the digital world, signpost sources of support, encourage positive online behaviour, and develop skills in areas such as public speaking and leadership. We recognise that young people are the best agents for change in their schools and communities and are best placed to help their peers learn about the online world.